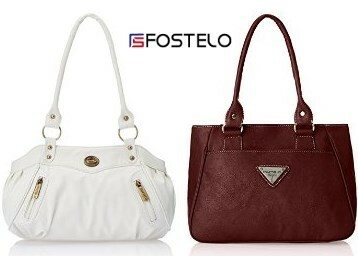 Explore the latest collection and enhance your style with trendy handbags of Fostelo. Paytm is offering 55% cashback on Fostelo bags. Now you can add a range of colours and designs in your wardrobe simply by choosing from their webpage. Logon to Paytm and select bags of your own choice and save upto 55%. Grab the deal now as the offer expires soon. You will get 55% cashback on your paytm wallet. Offer is valid till 29th Feb'2016. COD option is not applicable using coupon code. Offer is valid for limited stock.